Star Wars fever is sweeping the nation once again. For decades, multiple generations have fallen in love with the rag-tag bands of characters in the Star Wars world. The Force Awakens, as the latest in a long lineage, has its own band of adorable and lovable characters. And what better use for lovable characters than in Star Wars Valentines? It’ll be a few years before The Squish needs Valentines for school, but I will still probably print and give some of these to his teachers. 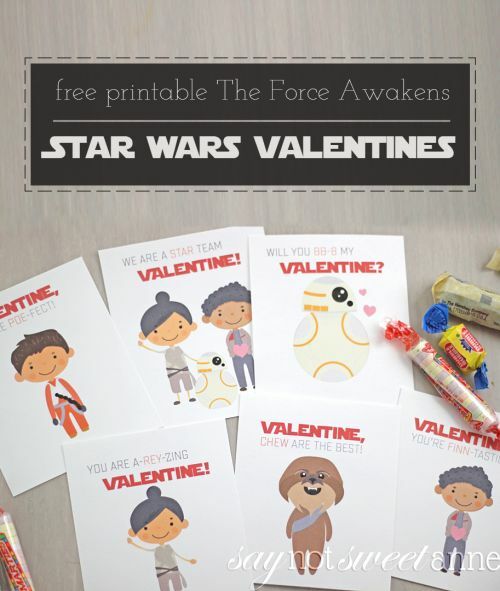 These printable Star Wars Valentines are just too punny to resist. With cute child-like versions of the Star Wars characters, they are kid friendly and super cute. Simply add a bit of candy (or don’t!) and spread the Star Wars love around the classroom. Using this printable is easy. The 6 Valentine ideas print all on one page. Cut them out, and attach some candy. I like to use pre-wrapped candies and a dot of hot glue to secure them. Sometimes I even up the puns by adding chewing gum to the “Chew are the best!” Chewbacca valentine, and follow suit for the others. 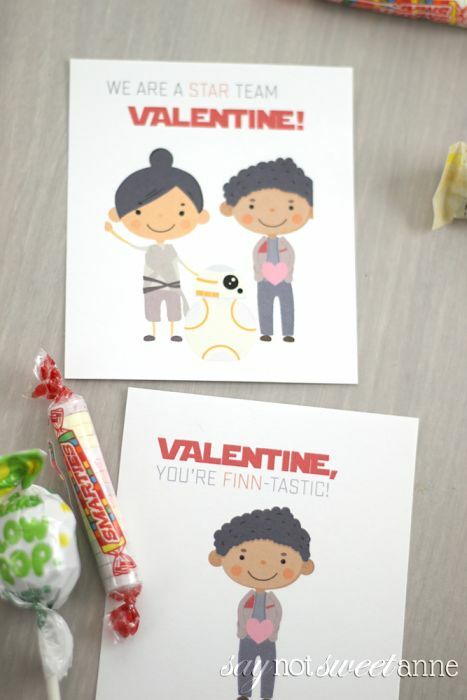 There are plenty of ways to use these Printable Star Wars Valentines!! Do you have a Star Wars fan in your family? Send them a Valentine!! So cute Kayla–thanks for sharing! thank you- these are so cute! These are adorable! I decided last minute to find something online rather that working up artwork on my own and I am so glad I did. Your Valentines will be heading to school in Utah later this week 🙂 Thank you for sharing!! !